What is the Weather Forecast screen? If you weigh yourself after 7:00 PM, it shows you the weather forecast for the next day. What do the pictograms mean? 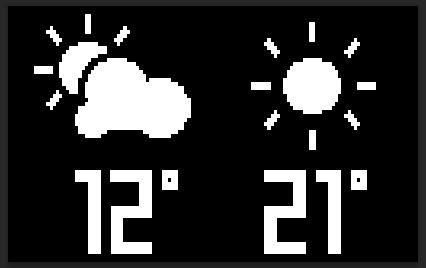 How does the Weather Forecast screen work? Based on your location, the scale connects to a partner service that specializes in weather forecasts. This data is then transferred and displayed on the screen of your scale. If this location is wrong, scroll down this page or click here. Note that this screen is only displayed if you set up your scale using Wi-Fi, as it needs to connect to the Internet to access the weather forecast service. My scale shows the weather forecast of the wrong city. How can I change this? Go to Devices in the Health Mate app. Tap Location of your scale. The temperature is not displayed with the correct unit. How can I change this? Go to Profile in the Health Mate app. Tap the Gear icon in the upper right-hand corner. Select the correct temperature unit. I don't want to see the Weather Forecast screen. How can I hide it? Tap the screen names to select or deselect them. Tap and drag the screen names to change the order. Body Cardio - No data is synced with my account. What should I do? Body+ - I can't see the weather / weight trend screen on my scale. What should I do? Body Cardio - What are the normal ranges for body composition?